Canon, Dell, Ricoh and Xerox are the first manufacturers to have qualifying products listed in the new imaging equipment category of the Electronic Product Environmental Assessment Tool, a global registry for greener electronics. EPEAT, which already operates a registry for computers and displays, finalized standards for imaging equipment last June. EPEAT allowed manufacturers to begin the certification process for the imaging device registry in early December. The registry opened for public view Tuesday, according to EPEAT. Other manufacturers will join the imaging equipment registry shortly, according to spokesman Jonas Allen. The registry covers products such as copiers, printers, scanners, digital duplicators, fax machines, mailing machines and multifunction devices. Imaging devices on the EPEAT registry must meet at least 33 environmental performance criteria. Products can achieve higher ratings by meeting some or all of 26 additional criteria. EPEAT’s certifications are based on a self-declaration system, which is then backed by post-market verification. Manufacturers must sign a contract requiring them to declare that their products meet system criteria, and must possess and produce evidence to support all declarations upon EPEAT’s request. EPEAT’s environmental rating program for electronic products is used by eight national governments, including the US. In the US, many local and state governments as well as universities base their purchasing decisions on the rating system. The organization was surrounded by controversy last summer when Apple withdrew its Macbook Pro with Retina display from the registry, and then reinstated it, leading to speculation that tough disassembly was behind Apple’s withdrawal from the standard. In October, EPEAT verified that the Macbook Pro with Retina display met its standards. At the time, EPEAT said all ultrathin devices listed in its registry, including notebooks from Apple, Lenovo, Samsung and Toshiba. met the organization’s environmental criteria. Xerox Corp. (XRX - Analyst Report) reported GAAP earnings of $335 million or 26 cents per share in the fourth quarter of 2012 compared with $375 million or 26 cents in the year-ago quarter, driven by decrease in sales in the Technology segment.. Adjusted EPS in the quarter stood at 30 cents, ahead of the Zacks Consensus estimate by 2 cents. Revenues in the quarter declined 1% (flat in constant currency) year over year to $5.9 billion, missing the Zacks Consensus Estimate of $5.8 billion. For fiscal 2012, revenue stood at $22.4 billion down 1% year over year. Operating margin was up 0.3 basis points to 10.3% in the fourth quarter, driven by savings from restructuring and lower selling and administrative expenses. Gross margin dipped 0.7% basis points to 31.5% in the reported quarter. This decrease was driven primarily by the higher overall mix of Services revenue. Revenues from the Services segment, which include Document Outsourcing (DO), Business Process Outsourcing (BPO) and Information Technology Outsourcing (ITO), rose 7% to $3.0 billion in the fourth quarter (with no impact from currency), driven by higher revenues from all three subdivisions. Growth in government healthcare, transportation businesses and customer care helped BPO revenues improve 8% in the reported quarter. Revenues from the DO segment rose 2% (with no impact from currency) due to new partner print services offerings. Revenues from ITO segment went up 15% (Including 1% negative impact from currency) on signings growth in the fourth quarter. Revenues in the Technology segment dipped 8% to $2.5 billion, with no negative impact from currency. The decline was attributable to a 14% fall in equipment sales and a 4% decline in annuity revenues. The disappointing performance of this segment stems from the fact that Xerox’s customers are migrating to its partner print services offering. Xerox had cash and cash equivalents of $1246.0 million as of Dec 30, 2012, compared with $902.0 million as of Dec 31, 2011. Total debt stood at $8.5 billion as of Dec 30, 2012, compared with $8.6 billion as of Dec 31, 2011. In fiscal 2012, Xerox focused on scaling its services business to align itself with growth opportunities in the $600 billion market. For first quarter 2013, the company expects adjusted earnings between 23 cents and 25 cents a share and expects adjusted EPS of $1.09 to $1.15 in fiscal 2013. However, the company needs to be wary of its competitors, which include formidable names such as Lexmark International Inc (LXK - Analyst Report) and Canon Inc (CAJ - Snapshot Report). LAKE SUCCESS, N.Y., January 14, 2013 – Canon U.S.A., Inc., a leader in digital imaging solutions, today announced several senior executive appointments and promotions to start the new year. "It gives me great pleasure to announce these well-deserved appointments and promotions," said Joe Adachi, president and chief executive officer, Canon U.S.A., Inc. "Each of these senior executives bring tremendous experience and proven leadership abilities into their new roles and will help position us for enhanced future success." Joseph Warren has been appointed senior vice president and general manager, Corporate Human Resources, Canon U.S.A. Formerly the senior vice president of the Customer Support Group and chairman of Canon Information Technology Services, Inc. (CITS), Mr. Warren has held numerous manufacturing and customer support positions within Canon U.S.A. and its subsidiaries over his 23-year career with the Company. Satoshi Nagata has been promoted to president of Canon Information and Imaging Solutions, Inc. (CIIS), a wholly owned subsidiary of Canon U.S.A. that delivers solutions in the areas of cloud computing and business process integration. In 2011, Mr. Nagata was named executive vice president of CIIS after a 30-year career with Canon Inc. in Japan where he served in various software engineering and executive positions. Yuichi Ishizuka has assumed Mr. Warren's former responsibilities as chairman and CEO of CITS, in addition to maintaining his current role as executive vice president and general manager, Imaging Technologies and Communications Group, Canon U.S.A. Having joined Canon Inc. in Japan in 1981, Mr. Ishizuka has held numerous sales and marketing positions within Canon U.S.A. and Canon Canada, Inc.
Doris Higginbotham has been promoted to president of CITS, a wholly owned subsidiary of Canon U.S.A. that provides support services for all small office and consumer products, including digital cameras, camcorders, printers, fax machines, copiers, calculators, and binoculars. Ms. Higginbotham has been with CITS since 1997 and most recently served as senior vice president of operations. Canon U.S.A., Inc., is a leading provider of consumer, business-to-business, and industrial digital imaging solutions. With approximately $45.6 billion in global revenue, its parent company, Canon Inc. (NYSE:CAJ), ranks third overall in U.S. patents registered in 2011† and is one of Fortune Magazine's World’s Most Admired Companies in 2012. In 2012, Canon U.S.A. has received the PCMag.com Readers' Choice Award for Service and Reliability in the digital camera and printer categories for the ninth consecutive year, and for camcorders for the past two years. Canon U.S.A. is committed to the highest level of customer satisfaction and loyalty, providing 100 percent U.S.-based consumer service and support for all of the products it distributes. Canon U.S.A. is dedicated to its Kyosei philosophy of social and environmental responsibility. To keep apprised of the latest news from Canon U.S.A., sign up for the Company's RSS news feed by visiting www.usa.canon.com/rss. Just how did Hewlett-Packard get itself into this pickle? That’s a complicated question, which includes a rotating door in the corner office and some remarkably odd decisions by the company’s board. But the root of the matter might simply be this: HP, a company that once used as its marketing slogan the word “Invent,” has been dramatically under-spending peers on research and development. What they’re not doing enough of, in short, is inventing. Moody’s senior VP Richard Lane took a close look at HP’s R&D spending habits in a new report and finds clear signs of decay. His approach: consider the R&D spending by a collection of peer companies, tote up what HP’s spending would have been if HP spent at the same pace based on a percentage of revenue, and compare the results. You can’t really look at how HP spends R&D dollars on a granular basis, but on a collective basis, it is clear that HP has been under-investing. Moody’s chosen peer set include Lexmark (in printing); Dell and Lenovo (in PCs); IBM (in servers); Accenture and Infosys (in services); EMC and NetApp (in storage); Cisco and Juniper (in networking) and Oracle (in software.) Those companies report R&D spending as a percentage of revenue ranging from 1.2% (for the PC companies) to 14% (for the networking companies.) Lane’s approach: apply the percentage of spending used by those companies to HP’s lines of business, and come up with what HP would have spent to be at parity. For the September 2012 fiscal year, HP reported R&D spending of $3.399 billion, which is 2.8% of revenue. Lane finds that if all parts of the company were spending at the same rate as peers, R&D would have been $4.5 billion – about $1.1 billion higher. And let’s remember that this is nto a new pattern. Ergo, HP has been under-investing in research for years now, a factor that no doubt has contributed to the fact that the company is shrinking at the top line. By Lane’s calculations, the company underspent its peers on R&D as a percentage of revenue for the last six years in a row. And he notes that HP’s growth rate has been below peer average for the last three years running. (Actually the company showed top line declines in FY 2012 and 2011. Lane notes in the report that the R&D rate used in the printing category was adjusted down from the 9.2% actual rate reported by Lexmark to reflect the fact that HP sources laser engines and toner from Canon, which does most of the R&D for HP’s laser printer business. For PC’s, he looked at Dell’s investment level through 2010, before the company began investing aggressively in storage and networking. That would be consistent with CEO Meg Whitman’s stated view that she needs five years to really turn the company around. Spending more on R&D won’t be an instant cure for what ails HP, but it will have to be part of the formula. Inkjet printing - when does the revolution start? Sometimes you can have too much of a good thing. A perplexing choice of some 30 different models and nearly as many suppliers confront converters planning to adopt single-pass inkjet printing. Products that range from roll-to-roll platforms to stand-alone modular presses, as well as hybrid flexo/inkjet presses, add another layer of complexity. Buyers understandably may have Darwinian thoughts about who will still be around to support their chosen press some years from now. With some heavyweight players involved, that's anyone's guess. Of course, it's not all bad news. A few vendors have made some impressive sales against a generally depressed economic situation. But then again, their target market of primarily short-run self-adhesive labels remains relatively buoyant. Furthermore, inkjet’s penetration by digital technology has opened up new types of added-value opportunities, notably versioning. Aided by on-the-fly changeovers, a single job run may include labels carrying differentiated graphics, text and variable data. As a global growth area, it allows brand owners to develop seasonal, promotional or niche marketing campaigns, while retaining brand integrity. It also covers areas of regulatory compliance where labels and packaging must accurately incorporate the required regulatory information. The much closer integration of front-end file handling within the full production workflow has enhanced inkjet's contribution to this market. As with digital printing in general, it contributes to faster press set-ups, quick job turnaround times and lower waste. The more advanced presses allow integration with management information systems that support sales and order processing modules. In a mixed production plant this can allow users to usefully free-up capacity on their conventional presses. Piezoelectric drop-on-demand printheads are the key to effective single-pass inkjet printing. The OEM manufacturers have concentrated on achieving smoother gradations and broader tonal ranges to boost print quality levels using a variety of proprietary techniques. Notwithstanding certain differences in gloss levels and color densities, they allow good inkjet printing to compare favorably with UV flexo printing. The same printheads have raised print speeds to around 24 m/min, or double that rate depending on imaging resolutions, grayscale levels or the number of interlaced printheads. As example, the ubiquitous Xaar 1001 printhead has a native resolution of 360 x 360dpi, but eight grayscale levels provide a higher apparent resolution of 1,080dpi. It uses so-called Hybrid Side-Shooter technology, which fires dynamically-variable drops from the nozzles to widen tonal ranges and allow the ink to flow directly past the back of the nozzles. Xaar's patented TF Technology is said to give a consistent, temperature-controlled flow rate and recirculation of ink within the head. Kyocera's KJ4 piezo printheads print paper or filmic labelstocks up to 50 m/min (164 ft/min) with four grayscale levels or 75 m/min (246 ft/min) with three grayscale levels. Domino Printing Sciences has adopted them for its N600i modular label press, developed and manufactured by Graph-Tech AG, which it recently acquired. Konica Minolta's UK technical partner, Industrial Inkjet, claims the new KM1024i reaches 80m/min at 360 x 720dpi using three grayscale levels. Beta tests using the next-generation KM1800i have resulted in even faster speeds with a 600dpi resolution. New 108-mm wide printheads allow the seamless stitching of fewer printheads across the web. In fact, wider web widths – commonly to 330mm or 13 inches – characterize the latest top-end modular presses. Besides CMYK, the latest UV-curable ink sets more widely include opaque white inks, as well as orange and violet or orange and green. These extra colors give an expanded color gamut option, allowing users to produce up to 90 percent of individual spot colors from a standard Pantone color palette. Users also report good translucency levels for these inks when printing metalized substrates. The wider adoption of UV LED curing is causing some interest. Once confined to inter-color curing, or pinning, before a conventional UV cure, full UV LED curing has begun to appear on some presses. Compared with conventional mercury-based UV lamps, LED's medium wavelength lamps use far less energy for ozone-free systems that are ideal for printing heat-sensitive substrates. They require dedicated inks and coatings, but simpler chemistry should make them cheaper with wider acceptance. With three product ranges, EFI Jetrion dominates the stand-alone market. It has taken an end-to-end approach with the 4900 series. Instead of off-line finishing with die cut tooling, models come complete with a dual-head laser die-cutter from SEI Spa. The line also includes matrix removal, inline corona treater, slitter module and twin spindle turret rewinding. As with all Jetrion models, it is fitted with Xaar 1001 printheads. The 4900M-330 is the latest variant, with a 13-inch web width. Stork Prints' DSI modular press offers CMYK, white and violet and orange, as well as a primer. The press has LED UV for interdeck pinning, with a final UV cure augmented with a water-cooled chill drum. The DSI can run with Stork's Rotary Screen Integration (RSI) technology. Printing at up to 720 sq m per hour, it delivers resolutions of up to 1,000 dpi, as well as 3D effects that resemble screen printing. The company won the 2012 Label Industry Award for Continuous Innovation. An advertorial with more details can be found on page 32. Durst's Tau 330 prints up to 48 m/min on a web of 330mm wide. Opaque white, plus orange and violet, are color options. The RIP software incorporates substrate and color management. The Tau 330/200 version has a web width of 200mm, and also uses Xaar 1001 printheads. The Tau 330 Variable Data Print option allows users to insert reels of die cut and pre-printed labels, while printing at the same rate as the host press. It can be integrated with Durst's Rotoworx 330 off-line finishing module with semi-rotary die-cutting. Heidelberg's Linoprint L (formerly the iTS600 from CSAT) uses Xaar 1001 four-level grayscale printheads to deliver a 600 x 600dpi resolution with four print widths up to 420 mm at speeds of up to 48 m/min. It features Phoseon's LED curing system and can either be operated as a standalone machine or integrated into packaging lines as a separate system with a feeder device. It includes variable data and anti-counterfeiting features. The Caslon hybrid concept developed nearly six years ago by Nilpeter and FFEI now comes with a White or spot color unit for placing before or after the CMYK Caslon print engine. It runs with webs up to 410mm at resolution-dependent speeds of 25m/min or 50m/min using Xaar 1001 printheads. Nilpeter typically sells the Caslon as part of a hybrid press with FA-4 UV flexo print units, die-cutting and other finishing units in web widths up to 420mm. FFEI offers the stand-alone version of the Caslon using Nilpeter's FA Line web transport system. The latest hybrid is the d-Flex from Focus Label Machinery, which prints CMYK with White at up to 50 m/min using Konica Minolta printheads. LED UV curing allows printing on clear and metallic films. The servo-driven press comes in widths of 142mm, 250mm and 330mm with the usual inline finishing options for either roll-to-roll or roll-to-sheet delivery. Finally, as a multi-pass press, Epson's high-end L-4033AW is an anomaly. It also uses a water-based pigment ink set for printing CMYK, White and Orange and Green using Epson's micro piezo, thin film printheads. The print quality is high, but production is slow. In a way it exemplifies the sheer variety of inkjet label presses available globally, as mentioned earlier. Furthermore, Epson is developing its own single-pass press, the SurePress X, which may appear in 2013 fitted with a full LED UV curing system. 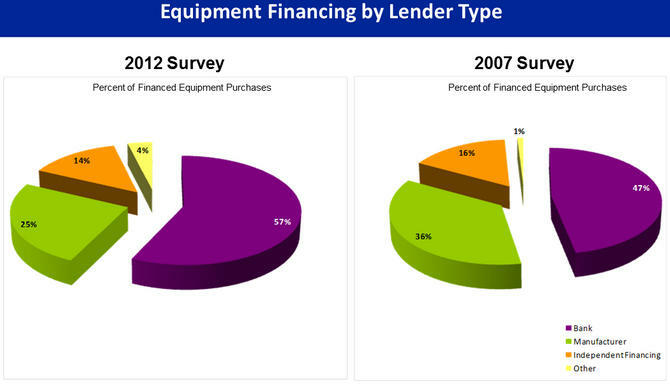 The Equipment Leasing and Finance Foundation (ELFF) held a briefing highlighted significant changes between 2007 and 2012, in the use of all types of financing to acquire equipment and software, especially the increased use of short-term credit to acquire equipment among businesses of all sizes, including both credit lines and credit cards, and the decreased volume of cash purchases. Over this same period banks increased their share of the equipment finance market, but mostly at the expense of captives rather than at the expense of independent finance companies. At the same time credit conditions are improving and demand for credit is growing. Overlaying these trends is an economy that in 2012 is growing slowly, if at all, but is expected to accelerate in the latter half of 2013. Finally, there is the dampening effect of the “fiscal cliff” on equipment acquisition decisions, which definitely affected the results. The briefers believe that GDP would grow by approximately 2.4% in 2013, with accelerated growth (3%) in the 2nd half of 2013. The major factor contributing to increased growth is residential housing, which the briefers expected to add approximately 1% to annual GDP growth, and 20 – 30,000 jobs/month, over the next several years. 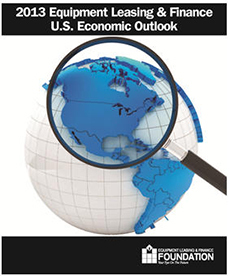 Other factors expected to contribute to economic growth in 2013 include increased business investment and consumer spending. The chart above illustrates the influence on residential investment on the growth in the overall economy, showing quarterly changes for the most recent 4 Quarters. 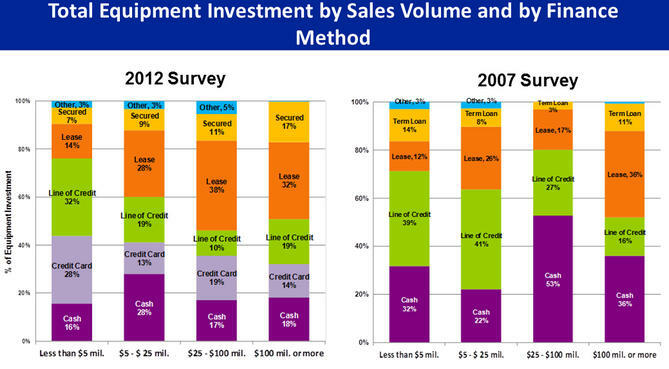 This table is yet another confirmation of the desire among businesses, over the past several years, to conserve cash. One of the briefers commented that he expected the effect of no agreement on the budget, in terms of GDP growth, to be “more of a slope than a cliff.” The actual effect of the “Fiscal Cliff,” in terms of Dollars, is approximately 4% of GDP, or $600 Billion against a GDP of approximately $15 Trillion. In 2012 the rate of growth in the use of financing, including leasing, to acquire equipment and software, exceeded the overall rate of growth of equipment and software acquisition by a significant margin. 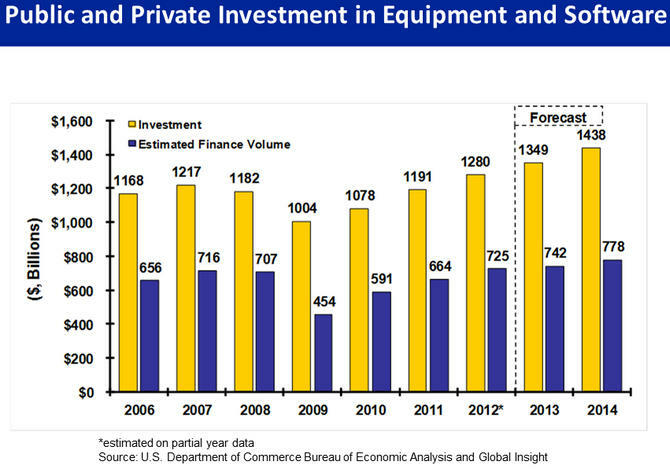 The bar chart below shows that 2012 will see public and private investment in equipment and software grow by approximately 7.5%, compared to 2011. The use of all types of financing to acquire equipment and software grow by approximately 9.2% during the same period. 2012 will the first year where the use of all types of financing, including leasing, is expected to exceed levels achieved in 2008. However, the use of all types of financing to acquire equipment and software, as a percentage of total acquisitions, is still lower than it was in 2008, 56.5% in 2012 compared to 59.8% in 2008. This compares to 45.2% in 2009, at the depths of the Financial Crisis, and supports the contention of the briefers that credit conditions are improving. In 2012 76% of all businesses used borrowed money on some basis, mostly by larger companies. In 2012 86% of all business with over $25 million in annual sales used borrowed money, compared to 46% of small businesses (less than $5 million in annual sales). The data shows that small businesses are making increased use of short-term financing to acquire equipment, including both lines of credit and credit cards. The chart above shows that during 2007 small businesses used lines of credit to acquire equipment and software only 39% of the time, compared to 60% of the time in 2012 and of this, approximately half was through use of credit cards. During the same period, the use of short-term financing by large businesses (over $100 million in annual sales) more than doubled, with a significant portion through use of credit cards. The chart above shows that between 2007 and 2012 banks increased their share of total equipment finance volume, from 47% to 57%. This increase came mostly at the expense of manufacturers and, to a lesser extent, from independent finance companies. The explanation at the briefing centered on banks’ lower cost of funds and the relative success of larger companies, who are likely better credits, in accessing borrowed funds. An additional explanation may also include the divestment by automobile manufacturers of their finance arms in 2008 and 2009, with Ally Capital moving from being a captive (formerly GMAC) to an independent finance company, the Chapter 11 bankruptcy of CIT Group in 2009 and decreased activity by captives in general during this period. According to the ELFF briefers credit conditions are improving, especially on commercial and industrial (“C&I”) loans. C&I loans are up 3% in the last 3 months and 13% year-over-year, however leasing volume during this period has decreased slightly. Part of the reason is illustrated in the table above, by increased use of short-term credit, both lines of credit and credit cards, to acquire equipment. Loan delinquencies are at a 3-year low. The briefers said that, overall, businesses remain cautious about making future investments in plant and equipment, influenced partly by the uncertainty over the budget negotiations in Washington, DC, referred to as the “Fiscal Cliff.” Assuming that agreement is reached, the prediction at the briefing was that it would take at least 6 months for most businesses to act on planned investments that have been put on hold pending resolution of the negotiations, thus the positive effect of an agreement will likely not be felt until the 2nd Half of 2013. The briefers stated that investment in construction equipment is, by far, the strongest sector, and must of the acquisition of construction equipment is being driven by construction in residential housing. This is expected to continue into 2013 with expected increases of 15% or higher. - Proposed medical device tax under the Affordable Care Act. Another issue, raised in the briefing was the effect of the possible end of bonus depreciation. The person responding to this question said that he didn’t think that the end of bonus depreciation would have much, if any, effect on equipment purchase decisions most of which, he believed, were driven by other factors such as availability of credit, expansion needs, and other factors. For most businesses, cash is still "king"
Hewlett-Packard Co. (HPQ) said it’s evaluating the disposition of businesses that don’t meet goals more than a year after Chief Executive Officer Meg Whitman said she didn’t plan to spin off the personal-computer division. “We also continue to evaluate the potential disposition of assets and businesses that may no longer help us meet our objectives,” Hewlett-Packard said in a Dec. 27 10-K filing with the U.S. Securities and Exchange Commission. That language wasn’t included in the document a year earlier. CEO since September 2011, Whitman is working to turn around Palo Alto, California-based Hewlett-Packard after five straight quarters of declining sales and years of botched deals, management tumult and strategic missteps. An $8.8 billion writedown of the acquired software company Autonomy Corp. in November renewed calls on Wall Street for Hewlett-Packard to realize shareholder value by shedding certain businesses, such as PCs and printers. Hewlett-Packard, the world’s largest maker of personal computers and printers, discussed the evaluation in the “Risk Factors” section of its regulatory filing, saying that any disposal would have possible drawbacks. “When we decide to sell assets or a business, we may encounter difficulty in finding buyers or alternative exit strategies on acceptable terms in a timely manner, which could delay the achievement of our strategic objectives,” Hewlett- Packard said. Hewlett-Packard also said in the filing that the U.S. Justice Department had opened an investigation relating to Autonomy. Hewlett-Packard accused the software company of misrepresenting its performance before being bought in 2011. The disclosure that Hewlett-Packard is evaluating disposing of assets or businesses came 14 months after Whitman said she would keep the company’s PC business in house. Her predecessor, Leo Apotheker, had explored a spinoff of the unit, which had $35.7 billion in sales in fiscal 2012, or 29 percent of the total. Whitman instead unified the PC and printer groups’ management under Executive Vice President Todd Bradley last year. The printer unit accounted for $24.5 billion in fiscal 2012 revenue, or 20 percent of total sales. Michael Thacker, a spokesman for Hewlett-Packard, declined to comment beyond the filing. Hewlett-Packard’s filing said it may “dispose of a business at a price or on terms that are less desirable than we had anticipated.” In addition, “the impact of the divestiture on our revenue growth may be larger than projected,” according to the filing. Shares of Hewlett-Packard gained 4.2 percent to $14.25 at yesterday’s close in New York. The shares declined 45 percent in 2012.